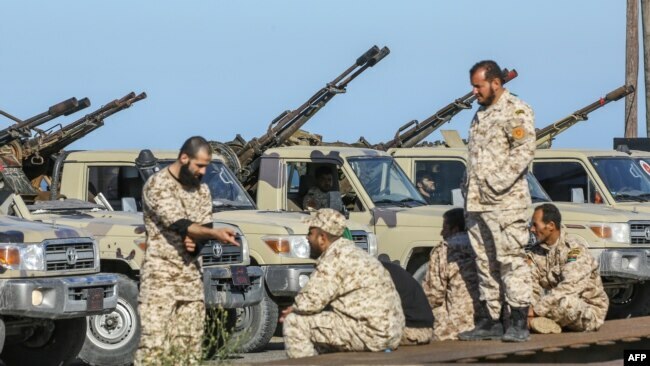 Forces loyal to Libya's U.N.-backed unity government arrive in Tajura, a coastal suburb of the Libyan capital, Tripoli, April 6, 2019, from their base in Misrata. Libya’s U.N. backed prime minister, Fayez Sarraj, says his government’s troops are prepared to confront the forces loyal to eastern Libyan military commander Gen. Khalifa Haftar, which appear to have gained ground along the outskirts of the Libyan capital, Tripoli. Sarraj called the action by Haftar an attempted coup. Arab media broadcast video of Haftar’s forces entering the gates of Tripoli’s now-closed international airport, before taking positions outside terminal buildings and along the now-unused runways. There did not appear to be any resistance to the takeover. Arab media also showed residents of neighborhoods near the capital cheering as Haftar’s forces entered. Saudi-owned al-Arabiya TV said Haftar’s forces had entered the Khalat al-Fargan district of the capital. VOA could not independently confirm the claim. Haftar’s military spokesman, Col. Ahmad Almismari, told a press conference Saturday afternoon that forces under Haftar’s command were gaining ground. He said Haftar’s forces were in control of the towns of Gharyan, Jendouba, Qasr al-Beshir and Suwani. He said 14 soldiers fighting with the Libyan army had been killed. The spokesman said air force planes loyal to Haftar had launched at least four raids near the Bab al-Aziziya military compound south of the capital, but that there were no casualties. He said, however, that planes from the nearby town of Misrata, which opposes Haftar, had killed a number of civilians in a raid over the town of Ghariyan, which Haftar now controls. 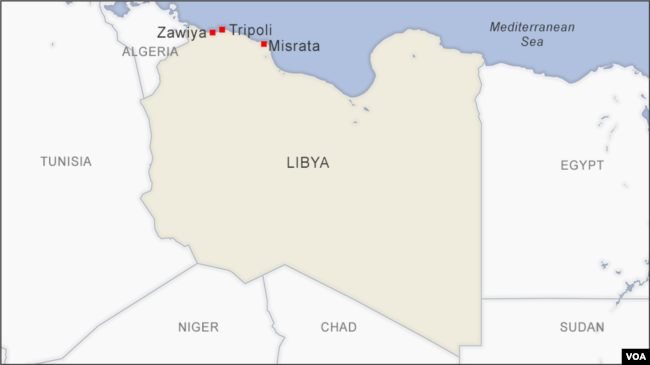 U.N. special envoy Ghassan Salame, who is in Libya, said he was monitoring the situation closely. He said tensions were increasing in a number of places in and around Tripoli and that he was keeping tabs on the situation. He said it was urgent that tension in those areas be ended and that civilians’ safety be ensured. In Cairo, Egyptian President Abdel-Fattah el-Sissi called on the international community to take action to restore stability to the Libyan capital. Foreign Minister Sameh Shoukri told visiting Russian counterpart Sergey Lavrov that Libya has been out of control since the revolution that overthrew Moammar Gadhafi in 2011. Shoukri said the situation in Libya has been worrisome over the past few years with respect to the lack of stability and spread of terrorism, increasing the danger to the Libyan people. Lavrov urged all parties to stop fighting and start negotiating and said the international community must prevent the situation from escalating. He urged Libya’s warring parties to cease military operations and sit down at the negotiating table.